Roy Manus Hinson, Jr. was born May 2, 1961 in Trenton. He attended Franklin Township High School in Somerset, graduating in 1979. He attended Rutgers University on a basketball scholarship. A 6'9" center, Roy continued to improve throughout his years at Rutgers, averaging 12.0 points per game as a sophomore, 12.5 as a junior, and finally 16.6 for his senior season in 1982-83. Roy became the second NBA first-round pick in Rutgers' history. After graduating from Rutgers with a Political Science degree, Roy was a first-round pick of the Cleveland Cavaliers, who took him with the 20th pick overall that year. Roy provided a defensive presence and solid rebounding, becoming the Cavaliers' go-to at the post. Although his free throw shooting was not the best and he was prone to fouls, he was an efficient scorer and was one of the better shot-blockers of the 1980's. 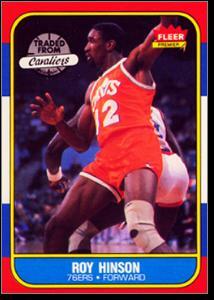 Roy's best year in the NBA was his 1985-86 season with the Cavaliers. He played 82 games and averaged 19.6 points per game. He was named the team's Most Valuable Player. In 1986, he was traded to the Philadelphia 76ers for their right to Brad Daugherty. After one and a half seasons in Philly, Roy was traded home to the New Jersey Nets. In 1990, Roy had his first of 12 knee surgeries, which would ultimately end his career. His final season in the NBA was in 1992. Over his eight years in the NBA, Roy played in 507 games, scored 7,206 points, averaging 14.2 points per game, and blocked 882 shots. As of 2011, he ranked 10th on Rutgers' all-time scoring list and is still considered that school's top NBA player. While playing in the NBA, Roy was active in charities and fundraisers for the Special Olympics, the Salvation Army, the NBA Players Association, and the Juvenile Justice System in New Jersey. Roy is now a Regional Representative with the NBA Players Association (NBPA), spearheading program development of the Financial Education Program. He also owns and operates Hinson Financial Services.